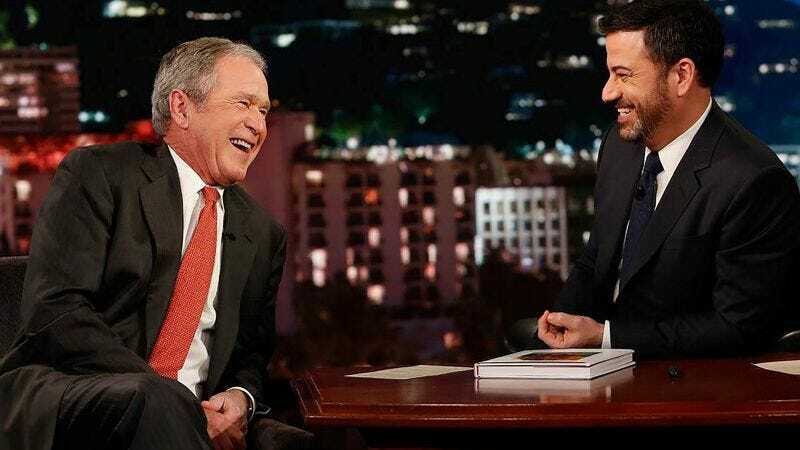 George W. Bush and Jimmy Kimmel yuk it up about a decade-old comedy sketch. Encouraged by today’s dramatically lowered bar for integrity, former President George W. Bush has been on a real comeback tour of late, basking in the sudden adulation of a public nostalgic for a kindler, gentler form of mendacity. Whether it’s showing off his paintings, hugging Michelle Obama, playing peekaboo with his poncho at the Inauguration, or offering a bog-standard defense of the importance of the press and not being racist, America’s 43rd president has been presenting himself as a cuddly rejoinder to the current administration—a reminder of a simpler time, when lying your way into an unending war that kills hundreds of thousands of people just seemed, y’know, friendlier. Like the kind of propagandizing war profiteering puppet of the oil industry you’d want to have a beer with. Bush is right: He absolutely did say “misunderstimate,” just one of many hilarious malapropisms and catchphrases Bush Jr. said during his career, from “Put food on your family” to that time he imitated executed death row inmate Karla Faye Tucker whimpering, “Please, don’t kill me.” Yes, these beloved “Bushisms” are all part of the reason why he’s remained America’s favorite goofball guy-who-let-poor-people-drown-next-door, and he remains a pretty good sport about it. As Bush told Kimmel, “I love humor, and the best humor is when you make fun of yourself [and doesn’t involve anything about the actual disasters you wrought on the economy, environment, education, global stability, and basic civil liberties].” Isn’t it great to see a president who actually has a sense of humor about himself, which is the incredibly low standard we’ve set now? Anyway, Bush’s Kimmel appearance followed a Wednesday guest spot on Ellen where they had a good time joking around about his “poncho problem” and not the time he called for a constitutional amendment banning gay marriage.